It is estimated that the company amassed $5 billion in debts, of which $3 billion should be paid to its creditors after bankruptcy protection. This still leaves a considerable amount of receivables that will not be repaid to creditors all over the US. 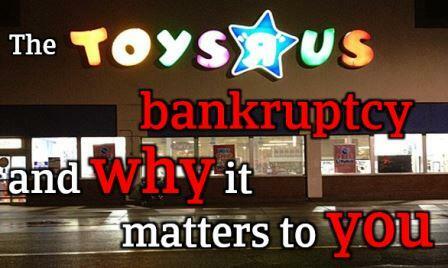 What’s worse, this bankruptcy doesn’t only interest Toys R Us’ direct vendors, but it is creating a ripple effect across the whole industry, affecting virtually every major toymaker in the country, such as Lego, Mattel, Hasbro and many others. Well, if you trade in the toys industry, for obvious reasons. However, even if you operate in a different type of business this is a telling story. In the past few months over 300 retail stores have closed in the US and Canada: think of HHGregg and Payless Shoes. The year 2017 also saw the bankruptcy of over 30 companies in the metal industry; the IT sector in the US has been experiencing deteriorating payment performance in the past 6 months, and even the manufacturing sector had to let go of big names such as CST Industries in Kansas City. Our priority was to remain clear and open at all times with our customers. Furthermore, as we see for Toys R Us, each one of these events contributes to creating a wave of slow payments and insolvencies across the industry, which could affect one or more of your long term, trusted clients. So, how is Atradius going to make a difference? Looking out for the unexpected is our bread and butter. In Toys R Us’ case, we were able to advise our clients to avoid long-term credit sales several months before the fact and recommended they stop shipping some days before the bankruptcy. “We tried to stay on cover as long as we could,” commented Regional Director of Atradius, David Huey. “Our priority was to remain clear and open at all times with our customers, keeping them informed of what we believed was the outlook of the company. By maintaining insurance coverage up to a few days before the bankruptcy, we were able to protect our clients from potential catastrophic losses”. Some may argue that Toys R Us’ default was not that hard to foresee, and it is true. But with over 240 million companies’ financial information in our global database, we may be able to track the spread and magnitude of this and other events and promptly forewarn you of any trouble that might affect your customers before you commit to more open term invoices. This is what peace of mind, safe trade and growth is all about.